Buyers bid up for best style. Home > Wool > Buyers bid up for best style. 22 Jan Buyers bid up for best style. 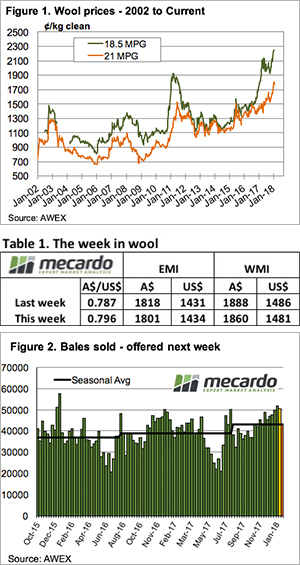 The wool market bubbled along at the higher rates reached last week, however, AWEX reported that this week buyers reverted to a more selective approach, in contrast to the past couple of sales where faults were overlooked. Wool that exhibited good measurements & style (high tensile strength & low mid breaks) once again attracted strong bidding albeit on a limited supply. The AU$ improved another US$0.01 over the week, this weighed on the buyer bids with the EMI losing AU$0.17 cents but gaining US$0.03 for the week underpinning the strong market sentiment. W.A. fell also with the WMI giving back 28 cents, closing the week at 1860 cents. The exception to the general across the board falls were the fine microns, with Sydney & Melbourne for example posting gains for the 17 MPG of 37 & 16 cents respectively. An interesting note is that in Sydney at the halfway mark of day one of selling, zero fleece lots had been passed in; a recognition by sellers that these are good prices to be taken up. The Skirtings section tracked a similar path to the fleece, although low VM lots were quoted as stronger, especially for 18.5 micron and finer. This is a continuation of the theme that has been building in recent months; with the market at very high levels the discounts for secondary types such as tender fleece and skirtings fade away. This week the selective approach by buyers returned. The result was that again best style wool was keenly sought while faulty types were quickly discounted. As outlined in Mecardo analysis this week, the merino pieces price follows the general story of the faulty type and is some 600 cents above the 2001 levels, while the 18 micron locks price is some 150% up on the 2001 level. Positive news from the cotton market emerged this week, India is responding to supply concerns by reducing exports which is expected to improve the prospects of US prices. The cotton market has been rising strongly and this week is just shy of its 8-month high point. This week Mecardo had a look at the wool production estimate on the back of the Australian Wool Production Forecasting Committee report. Sheep offtake rate continues to be supportive of an increase in sheep numbers, with flock modelling pointing to an increase in the flock size in 2018-2019, due to the high wool prices in relation to the wheat price. However, the projected rise in sheep numbers is only a modest 2.6% next season. Based on previous wool producer responses, any reduction in price levels will see the pass-in rate jump; growers have been bullish over recent times and are prepared to hold wool back in this market of “just in time” supply. 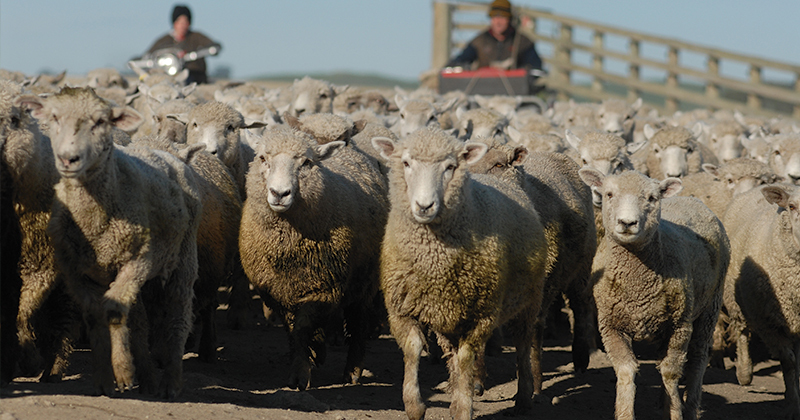 Along with strong demand, the limited supply of fresh wool combined with wool grower’s optimism the market is unlikely to retrace any time soon. Next week 43,297 bales are rostered for sale across the three selling centres. It is of note that 50,499 bales were cleared to the trade this week.